Elder had everyone in our church, young and old, read this book. I have just finished it for the second time and wanted to recommend it to all of my blogging friends. This book talks straight about a subject that we cannot ignore any longer. You say that you don't have this problem? Either you will face it, or you will know someone who will. Why not be ready anyhow. I promise you will not be disappointed in this book....it is very thought provoking. When you read it, I would love if you would come back and let others know what you think! For thirty years Randy Alcorn has been encouraging people-young and old-to pursue the rewards of sexual purity. Too often we settle for a compromised Christianity that's just a baptized version of the world's sad existence, rather than the abundant life to which God calls us. This book deals with - raising children to embrace sexual purity - providing an example of purity in the home - protecting purity in dating (at any age) - and maintaining purity in marriage. Biblical, practical, and concise, The Purity Principle is a one-stop handbook for individuals, families and churches. Some people have given up on purity. Some have never tried. 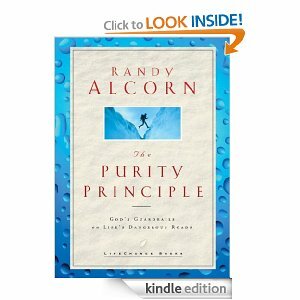 Bestselling author Randy Alcorn shows us why, in this culture of impurity, the stakes are so high—and what we can do to experience the freedom of purity. Impurity will always destroy us; purity always leads to higher pleasures! Choose wisely. Let the insights of this amazing book—written for old and young, married and single—help you gain your footing on the path to truly lasting joy.